Cancer is the second leading cause of death worldwide. There is always a huge demand for novel anticancer drugs and diverse new natural or synthetic compounds are developed continuously by scientists. Presently, a large number of drugs in clinical practice have showed pervasive side effect and multidrug resistance. Sulfonyl or sulfonamide hybrids became one of the most attractive subjects due to their broad spectrum of pharmacological activities. Sulfonyl hybrids were broadly explored for their anticancer activities and it was found that they possess minimum side effect along with multi-drug resistance activity. 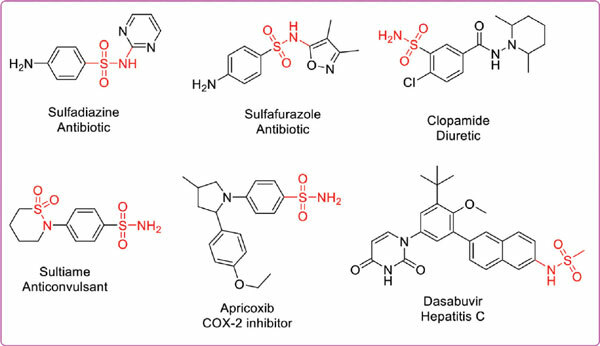 This review describes the most recent applications of sulfonyl hybrid analogues in anticancer drug discovery and further discusses the mechanistic insights, structure-activity relationships and molecular docking studies for the potent derivatives. Sulfonyl, sulfonamides, anticancer, SAR, hybrids, cancer.